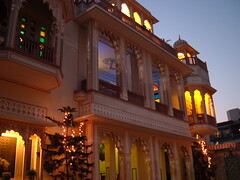 We had a good breakfast in Jaipur, and paid our bill of 600Rs (which covered two full meals and breakfast). This is about 8 quid. We went to the City Palace Complex in Jaipur first, this is a huge palace complex where the Maharaja and his family still live. India used to be a large collection of individual kingdoms, and at Independence the way that they got the kingdoms to join India was to allow the Maharajas to keep some perks and privileges. These were removed by Indira Ghandi in the 70s, but some families were independently wealthy enough not to need Government support. 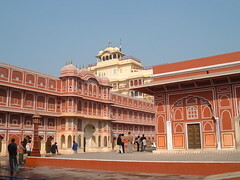 The Pink City of Jaipur was once a yellow city, but was painted pink as a welcome to the Prince of Wales in 1876. 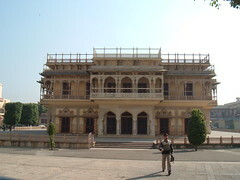 As we entered the City Palace, we were greeted by the Mubarak Mahal, or Welcome Palace. This was built as a guest house for visiting dignitaries. Today it's a museum. The guards there will offer to pose for photographs, and then cheekily ask for a donation (but it's not much - and they were very nice, giving us Masala tea). There are shops in the square surrounding the Mubarak Mahal, they do try it on a little bit, and overcharge mightily for westerners. In an adjoining courtyard is a building which houses two large silver flasks. These were made for a visit to London by the Maharaja to carry holy water from the Ganges. They're guarded, of course. A small and easily overlooked passageway leads to the Chadra Mahal courtyard, providing a good view of the main residence of the Maharaja's family. 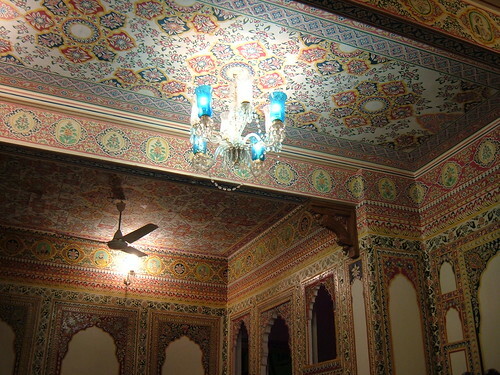 The doorways are ornately decorated, with the surrounding arches handpainted with intricate designs. We stopped in the palace café, which was reasonably priced, but expensive by local standards. On the far side of the palace café was a snake charmer with a Cobra. He was encouraging people to stroke the hood of the Cobra - I wasn't happy about it, but Monica obliged. When we got back to the car, our driver, Mr. Sharma had acquired a friend named Pradeep, who was in training to be a guide. Mr. Sharma was Pradeep's uncle. We were a little wary, but went along with it, and are glad to have done so. Pradeep took us to a memorial off the Amber Road. This memorial is a bit off the beaten track, but very impressive indeed. The city walls which snake up to the Amber Palace come down the hillside at this point . 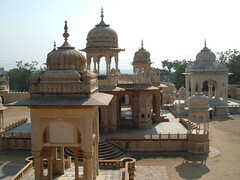 The memorial is apparently the cenotaphs to the Maharinis of Jaipur, and Pradeep said something about Madho Singh II. 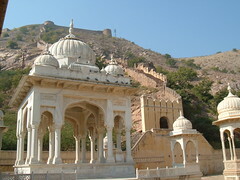 From here we went up to Jaigarh, the Amber Fort. Here we found the Jaya Vana, which was the biggest cannon in the world when it was cast, with a range of some 22 miles. Below the cannon is a pond (and a long drop), so that after lighting the fuse the men can jump to safety. Our next visit was very close to the city palace complex, the Janter Manter. For me this was the highlight of Jaipur. 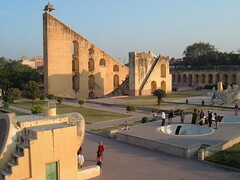 The Janter Manter is a collection of odd looking sculptures (to the untrained eye), in reality they're a wonderful collection of astronomical instruments, including a sundial with 20 second accuracy (note, this is local time, for Indian Standard a correction must be made). There are all sorts of devices at the Janter Manter (which means calculating machine, and actually refers to a pair of discs which hang like gongs). We had another visit to a textiles place which was close to the Janter Manter and then we were ready to go to the hotel. After a respite during the visit the the Janter Manter (it was great!) my headache had returned. For reasons to do with room availability we had to change hotels, we had dropped off our bags in the new hotel that morning, thus we were returning to the Shahpura hotel. This hotel is in Devi Marg, and is full of marble and incense. 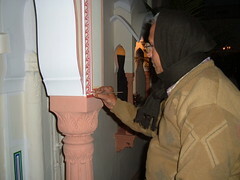 The walls are handpainted, with a tiny brush, and we saw the decorator whilst we were there. This is detailed and time consuming work. We were on the first floor, room 112, and the music from the dining room filtered upstairs to us. Including Frere Jacques on the sitar. This was all very nice, except that due to the limited repertoire we had Frere Jacques repeated several times. We went down to the handpainted dining room for our evening meal. Monica had Yakhani Mutton, Palak paneer, and Veg Pulao. The mutton came with a lime/honey sauce and Palak paneer is paneer in a dark green sauce. I had Rajasthani Sula, which I really liked. I had this with butter naan and stuffed paratha. The sula was lamb which had been marinated in spices and cooked on charcoal. For desert we had halwa, which is made with semolina and carrot. I don't normally like semolina, and so it was a lovely surprise that I really enjoyed this. It had a lovely colour to it, and the consistency of grated coconut.